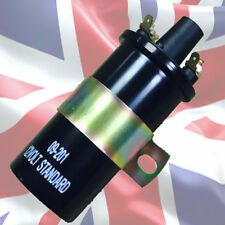 This is our 43D Non Vacuum with top cap for Ford Crossflow and pre-cross flow Engines. For example, in a 4 cylinder engine the distributor will rotate 360 degrees. Each cylinder will account for 90 degrees of the rotation. 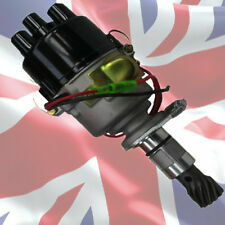 It is suitable for nearly all Classic 12Volt 4 and 6 cyl cars. Now the clever bit. When the engine is cranking the starter solenoid feeds the coil directly with 12 volts, bypassing the resistor. When a car is first started, the oil is thick and the engine is cold and hard to turn, so the starter will draw a large amount of current. For example, in a 4 cylinder engine the distributor will rotate 360 degrees. Each cylinder will account for 90 degrees of the rotation. The dwell angle is normally set by adjusting the points gap. What is Dwell and what is "Adaptive Dwell "?. Electronic Ignition Kit for Bosch JFUR4 4 Cylinder. SKU: K9 - Electronic Ignition Kit for Bosch JFUR4 4 Cylinder, 1 Piece, Left Hand Points Distributor. 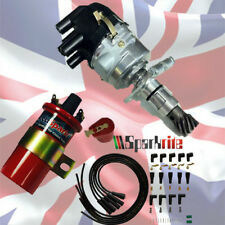 This kit is designed to replace the points and condenser inside Bosch 4 Cylinder, Left Hand Points Distributors. For example, in a 4 cylinder engine the distributor will rotate 360 degrees. Each cylinder will account for 90 degrees of the rotation. The dwell angle is normally set by adjusting the points gap. If you reading is more than 80% you should use a non ballast coil ,Lucas DLB105. This is the LUCAS 12 Volt 3 ohms Sports Coil. Benefit from the increased windings that give the Lucas Gold Sports coil over 25% extra potential. This is our 43D Non Vacuum with side cap for Ford Crossflow and pre-cross flow Engines. For example, in a 4 cylinder engine the distributor will rotate 360 degrees. Each cylinder will account for 90 degrees of the rotation. This is the AccuSpark 12 Volt, 3 ohms Ignition Coil with screw on HT Lead connector. Not suitable for Factory Electronic ignition. 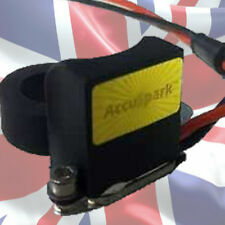 AccuSpark 8mm Blue HT Leads for Ford Crossflow. For example, in a 4 cylinder engine the distributor will rotate 360 degrees. Each cylinder will account for 90 degrees of the rotation. The dwell angle is normally set by adjusting the points gap.